MSC Cruises offers you a marvelous cruise vacation. Best prices and special offers at Dreamlines. Founded in 1988 following 300 years of family seafarer tradition, MSC Cruises has become a world leader in memorable cruise vacations. Consisting of 12 ultramodern ships, the MSC Cruises fleet is renowned for its authentic Mediterranean ambiance which provides a superior vacation experience. An eco-friendly cruise company, MSC Cruises boasts a superb entertainment program including Broadway- and Las Vegas-style theatre performances, Cirque de Soleil acrobatic shows, live music and more. To unwind, guests can take advantage of a sanctuary of wellbeing and relaxation at the authentic Balinese MSC Aurea Spa, or indulge in an exclusive haven of refinement at the luxurious MSC Yacht Club. Partnerships with Lego® and Chicco Toys make MSC Cruises a hit with families, and exquisite restaurants like Eataly, Kaito Sushi Bar and Silver Service Restaurant are sure to impress the finest of dining connoisseurs. Discover top cruise destinations in the Mediterranean, Caribbean, Cuba, Mexico, and Panama onboard the MSC Divina, MSC Meraviglia, MSC Fantasia or the highly anticipated 2017 new addition, the MSC Seaside. MSC Fantasia is a popular, crowd-pleasing ship with a European onboard atmosphere. She offers relaxing voyages to warm-weather locations in the Caribbean and Mediterranean. The MSC Orchestra is the perfect ship for budget-conscious and environmentally-minded passengers. Sailing around the world, she is a popular ship among families, sun-seekers, and travelers looking for an authentic European experience. The MSC Musica is a vision of grandeur. Travel to exotic ports in utmost style on a cruise with this magnificent ship. The opulent interior decor features the best in Italian design. MSC Opera is an elegant, stylish cruise ship that balances sophistication with being family-friendly and relaxing. Renovated in 2015, the ship has a contemporary design with some elements being inspired by the ship's Cuba itineraries. A Musica class ship, the MSC Magnifica is a quintessential MSC ship which sails to popular destinations around the world. Passengers can expect family-friendly itineraries, traditional evening entertainment options, an international onboard atmosphere. Top-notch destinations, world-class cuisine, and lavish design await on the MSC Armonia. Enjoy an authentic European cruise as you sail international waters on this elegant, mid-sized ship. This mid-sized ship is a true crowd pleaser. With a variety of onboard activities, an intimate onboard atmosphere, and loads of options for families and kids, the MSC Sinfonia is the perfect ship for a dream vacation. MSC Poesia combines superb craftsmanship with innovation to provide a fantastic cruising experience for all who steps aboard. Complete with the MSC Aurea Spa, a cruise on board MSC Poesia promises to be a rejuvenating one. There's something for everyone on the MSC Lirica. Are you a foodie looking to indulge in some mouth-watering cuisine? A family traveling with kids? A couple looking to relax by the pool or in the spa? The MSC Lirica has you covered. The MSC Divina’s name is symbolic of your future cruise experience; ‘The Divine’ state-of-the-art cruise ship is the pride of the MSC fleet and promises a vacation to remember. Sensuous spa facilities, world-class dining, and family-friendly entertainment are just some of the perks that await you on the MSC Preziosa. Enjoy the gliz and glam of onboard life between stunningly serene ports of call around the world. Cruise onboard MSC’s new flagship, the MSC Meraviglia. The stunning new ship offers the latest and greatest in cruising, from beautiful design, exceptional comfort, and mind-blowing entertainment. The beautiful MSC Seaside is one of the most technologically advanced cruise ships in the world and cruises to the Caribbean from Miami and Orlando. The second ship in MSC's Seaside class, the MSC Seaview is the largest and newest ship in the MSC fleet. Modeled after a stylish beach condo, she embarks on exciting, family-friendly itineraries in the western Mediterranean. 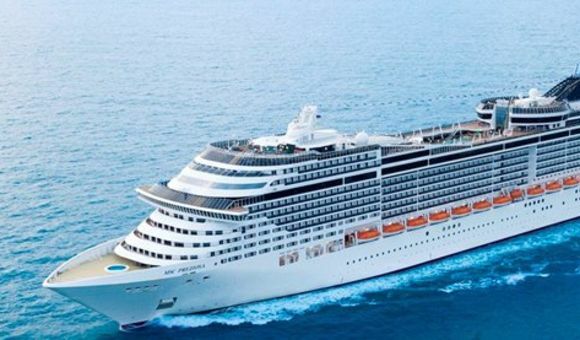 Set to embark in 2019, MSC Bellissima is the newest ship in the MSC fleet. Outfitted with innovative new design features, she's perfectly equipped to deliver an action-packed Mediterranean cruise vacation the whole family can enjoy. Launching in 2019, the MSC Grandiosa will have all your favorite features from the MSC Meraviglia and more. From expanded deck areas by the pool to a one-of-a-kind Cirque du Soleil show at sea, this ship is expected to be bigger, more elegant, and more fun than ever before. Setting sail in 2020, the MSC Virtuosa will be equipped with all the bells and whistles of her sister ship the MSC Grandiosa and some! From two unique Cirque du Soleil at Sea shows to the Polar Aquapark that offers stunning views of the sea from above, the MSC Virtuosa will amaze anyone who climbs onboard. Swiss-based MSC Cruises is an international cruise line with its headquarters in Geneva. It is part of the Mediterranean Shipping Company and is one of the world’s biggest players in cruising with its fleet of twelve ships. Ultra-modern MSC Cruises ships have won prestigious awards in recognition of its commitment to conserving the world’s oceans and environmental protection. MSC Cruises is proud of its Mediterranean heritage allowing you to experience the purest Italian hospitality and authentic traditions while sailing around the globe. Whether you are looking to relax on beautiful Caribbean islands with palm trees or gaze at the futuristic architecture in the Middle East, MSC Cruises can help you experience it all. Looking to create happy memories with your kids on your next family vacation? With the company’s emphasis on the Mediterranean way of living, guests can expect an unforgettable travel experience. Due to good cruise deals, there are many families on board. With an immense selection of family-friendly activities – aqua park, water slide, 4D cinema, you can feel that children are more than welcome aboard. MSC Cruises greets families with varied programs of whole-family and supervised activities for separate age groups meanwhile grown-ups are enjoying Balinese massage or gambling at the casino. A family-friendly cruise line offers much more than ever imagined with absolutely no compromise in quality! MSC ships depart from various international cities and can bring you to the most breathtaking destinations in the world. Discover changing and developing the Middle East with its vibrant cities and striking modern architecture. Ever dreamed of taking a year off and sailing around most fascinating places on earth? Make your dream come true with MSC World Cruises! During this “once in a lifetime” cruise visit Africa, Asia, Caribbean Islands, Mediterranean, Australia… Start your life changing experience and explore the globe by cutting through the waves with MSC Cruises. MSC Cruises boasts a fleet of 12 innovative ships with stylish cabins, upscale onboard experience, and festive atmosphere. MSC Fantasia entered service in 2008 and since then features style, elegance, and class at sea. MSC Fantasia offers lots of activities to engage in while sailing. Simply enjoy a drink at the Aqua Park with its 150 illuminated musical fountains or laze in the sun at the pool with a retractable roof. MSC Fantasia has a variety of bars and lounges for you to explore day and night. Eco-friendly MSC Seaside brings new things to explore – shopping, dancing, dining. Evenings are particularly memorable, guests can check out the Royal Palm Casino or enjoy spectacular performances on stage at The Strand Theater. MSC Seaside is the place to experience ultra-luxury cruising. With MSC Divina your every wish is fulfilled. Discover the most exciting destinations while traveling in glamorous style aboard MSC Divina. Spacious and yet intimate MSC Divina significantly raises the bar in the luxury cruise market while satisfying the most discerning voyagers.